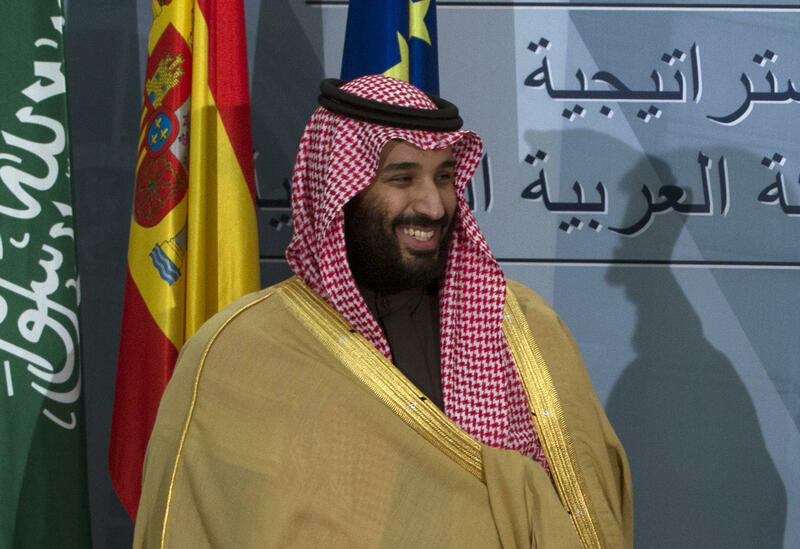 Saudi Arabia's Crown Prince Mohammed bin Salman is shown during a visit to Spain in April. At 33, Mohammed is the kingdom's de facto ruler, and he faces increasing criticism for his handling of issues ranging from the Saudi role in Yemen's war to the recent disappearance of a Saudi journalist in Turkey. But Mohammed, now the crown prince at age 33, is facing far greater scrutiny for the repeated crises that keep cropping up in a place that has long preferred to be slow, steady and out of the spotlight. The latest is the disappearance of prominent Saudi journalist Jamal Khashoggi, last seen entering the Saudi Consulate in Istanbul on Oct. 2. Turkey says it believes Khashoggi was killed. The Saudis deny this, but they haven't provided any solid information indicating whether he is alive or dead. "The explanations I hear coming from Saudi Arabia make no sense," said South Carolina Republican Sen. Lindsey Graham. "If [Khashoggi] was murdered in the Saudi Consulate in Istanbul, that would cross every line of normality in the international community." Mohammed has cultivated close relations with President Trump and his son-in-law, Jared Kushner. Trump says he wants to know what happened to the missing journalist — a Washington Post columnist who lives in Virginia — but the president has been only mildly critical of the Saudis. "This took place in Turkey, and to the best of our knowledge Khashoggi is not a U.S. citizen," Trump said. He added that planned Saudi purchases of U.S. military hardware should not be jeopardized. "As to whether we should stop $110 billion from being spent in this country, that would not be acceptable to me." But others say Mohammed's actions are increasingly worrisome. "The kingdom's behavior now presents new challenges for a Trump administration heretofore all too forgiving of this leadership," said Gary Grappo, a former U.S. ambassador and diplomat who served throughout the Middle East, including Saudi Arabia. "The Saudis are marching headlong into uncharted and dangerous territory for themselves and Washington," Grappo told online publication The Cipher Brief. In Saudi Arabia itself, Mohammed and his father, King Salman, who is 82, place tight restrictions on any expressions of opposition. Khashoggi has been one of the few critics, though a relatively mild one. Still, he fled the kingdom for Washington, D.C., last year out of concern for his safety. War in Yemen: The Saudi intervention in 2015 was intended to end the civil war and install a friendly government on Saudi Arabia's southern border. But the conflict grinds on, widely seen as a quagmire and one of the world's worst humanitarian disasters. Mohammed, who is also the Saudi defense minister, has been the driving force behind the Saudi bombing campaign, which has been blamed for many civilian casualties. The U.S. is supplying his government with those bombs, and both Democratic and Republican U.S. senators are growing increasingly impatient. "The Saudi coalition has failed to adopt some U.S. recommendations while civilian deaths and casualties due to coalition airstrikes have increased dramatically in recent months," several senators wrote in a letter Wednesday to Secretary of State Mike Pompeo. Blockade of Qatar: The Saudis continue to impose a comprehensive blockade on neighboring Qatar, saying the tiny emirate has long supported radical Islamist groups. Qatar's wealth, based on its huge natural gas supplies, has allowed it to carry on quite comfortably since the boycott was imposed in June of last year. But the standoff has kept tensions bubbling in the region. Both Qatar and Saudi Arabia are U.S. allies, but Washington hasn't been able to broker a solution. Qatari Foreign Minister Sheikh Mohammed bin Abdulrahman Al Thani said recently in New York that the dispute remains a "stalemate," adding, "Qatar can also wait forever." Detention of Lebanon's leader: A trip to Saudi Arabia by Lebanon's prime minister, Saad Hariri, turned downright bizarre last year when the Lebanese leader made a videotaped statement saying he was resigning. Hariri remained out of public view for days, before finally returning to his homeland and rescinding the resignation. Some mysteries of that episode have never been fully explained. But media reports say the Saudis pressured Hariri to "quit" because he was not doing enough to oppose his rival Lebanese group Hezbollah, which is backed by the Saudis' archrival, Iran. Arrests of female activists, wealthy Saudis: While women are gaining some additional freedoms under Mohammed, several female activists were arrested in May. Khashoggi discussed the arrests in an interview with NPR at the time. "To arrest ladies, that is unheard of in Saudi Arabia, and especially ladies 60, 70 years old," Khashoggi said. "They were called traitors, and some of the media — the government media outlets — pictures were posted with the word 'traitor' in Arabic splashed in front of their faces." And last November, dozens of the kingdom's princes and wealthy businessmen were detained at the Ritz-Carlton hotel in the capital Riyadh on charges of corruption. Many remained in their gilded prison for months — until they reportedly agreed to give up some part of their fortunes. Initially, Mohammed's actions were seen as an effort to forge a new path by cracking down on corruption, making Saudi Arabia's strict form of Islam more moderate and playing a larger role in regional security. But increasingly, his moves are seen as misguided attempts to silence critics at home and impose his will on neighbors, with little regard for the negative fallout. "The Saudis in general and [Mohammed] in particular have been acting without a net, without America's counsel," said Grappo. "And they're making strategically bad mistakes."